Through a thorough process of research, design and development and an innovative approach to manufacturing, Walker Filtration has created a broad range of unique filter elements in differing grades of efficiency. 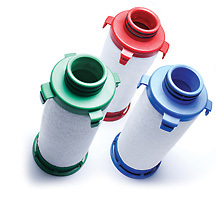 Walker Filtration filter elements are specifically designed to offer proven performance in a range of applications including industrial, laboratory and medical. We believe that our choice of materials, combined with our industrial expertise and rigorous in-house testing, gives us a superior product to complement our range of compressed air filter housings and dryers. Our custom made filtration media combines high flow rates and high dirt holding capacities without compromising long life performance. In order to guarantee filtration efficiency, Walker Filtration use its own uniquely designed testing facility, employing mono-dispersed aerosol to challenge the elements and near forward light scattering techniques to measure and confirm particle retention. To ensure our customers have complete peace of mind when buying Walker Filtration Original Elements, we ensure they are independently tested and validated using ISO 12500 to meet the requirements of ISO 8573-1:2001(E).